If your computer runs the Oracle Database system, you can enable application-aware processing to create a transactionally consistent backup. The transactionally consistent backup guarantees proper recovery of Oracle databases without data loss. Select Require successful processing if you want Veeam Agent for Linux to process Oracle databases. With this option selected, if an error occurs when processing an Oracle database, Veeam Agent for Linux will stop the backup process. If you select this option, you will have to specify settings for database log handling on the Oracle tab of the Processing Settings window. For more information, see Oracle Archived Log Settings. Select Try application processing, but ignore failures if you want Veeam Agent for Linux to process Oracle databases. With this option selected, if an error occurs when processing an Oracle database, Veeam Agent for Linux will not stop the backup process. Instead, Veeam Agent for Linux will skip this database and proceed to the next one. After the backup process completes, you will be able to restore data from the backup and restore databases that were successfully processed during backup. 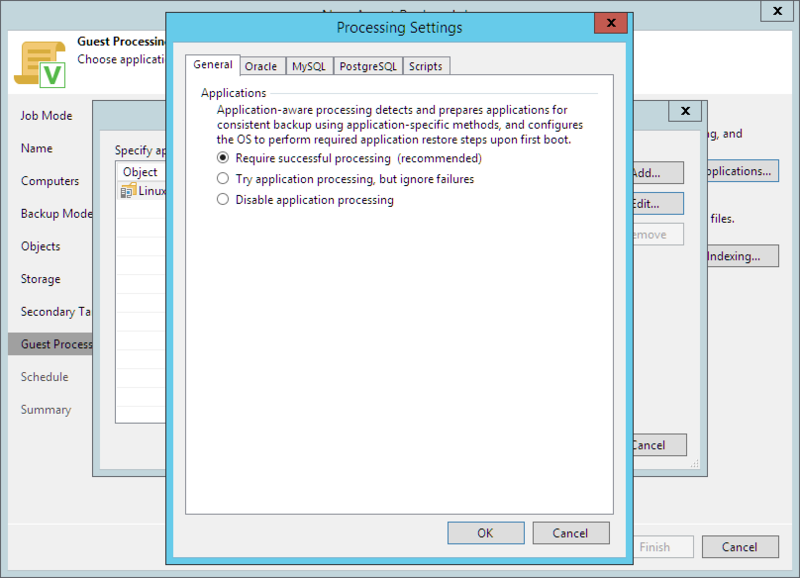 Select Disable application processing if you do not want Veeam Agent for Linux to process Oracle databases. If you select this option, the Oracle tab of the Processing Settings window will become unavailable. You will be able to specify pre-freeze and post-thaw scripts for the job on the Scripts tab of the window.